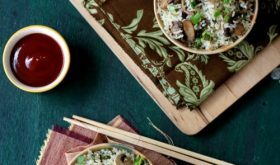 Mushroom fried rice is a simple, flavorful meal on its own that you can fix in less than 20 minutes if you have some left over cold rice on hand. 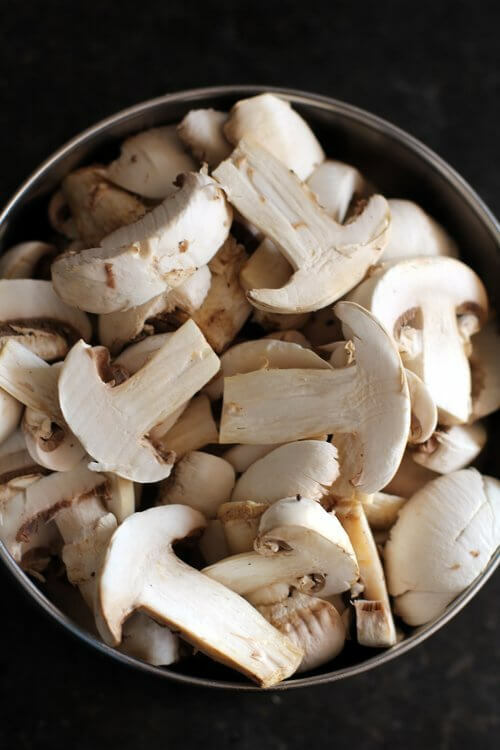 The ingredients are minimal and you can use vegetables like capsicum, carrot, beans, cabbage, corn and cauliflower to compliment the mushrooms. Fried rice is a classic and verstatile dish that can be made with veggies, eggs, chicken, meat and prawns or a combination of all of them. You can refer to the recipes of vegetable fried rice, corn manchurian fried rice and prawn fried rice that I have blogged earlier. Its a blessing that everyone at home is fond of fried rice. Whenever I feel lazy and do not want to spend much time in the kitchen, left over rice comes to the rescue. I end up cooking chinese fried rice restaurant style either veg fried rice or egg fried rice and serve it with a sweet and sour sauce or a simple tomato sauce. 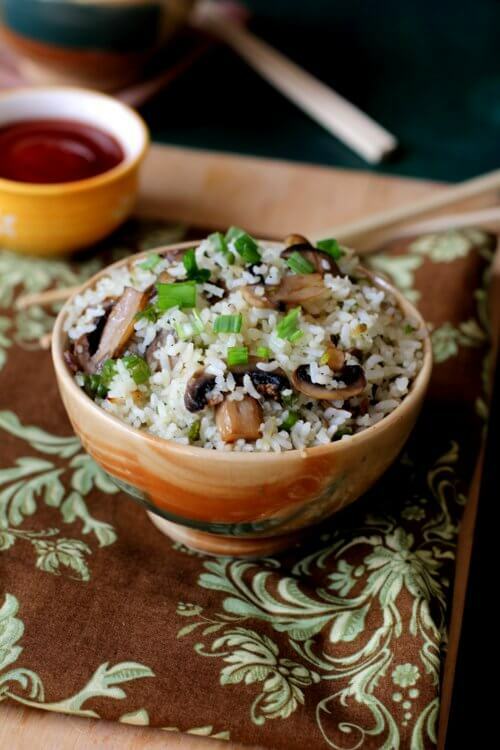 I am sharing a simple, quick, easy recipe of mushroom fried rice restaurant style. 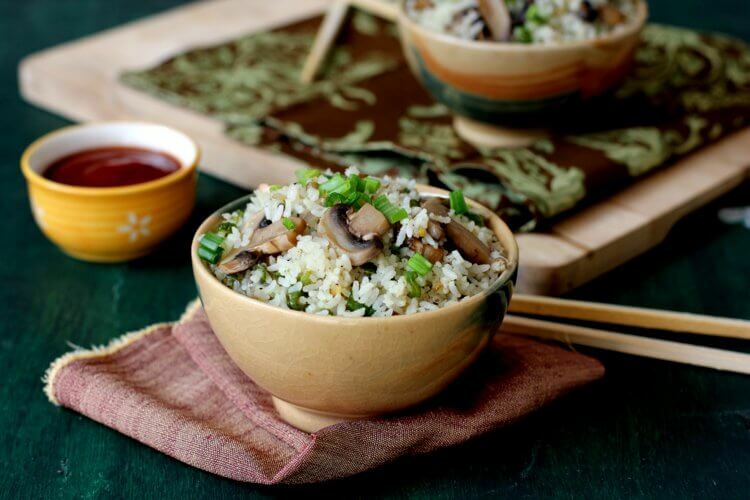 There are many variations to the recipe of mushroom fried rice, an indian chinese style preparation. Veg mushroom fried rice is loaded with mushrooms, fresh vegetables like capsicum and beans, spring onions, minced garlic, soy sauce, a splash of vinegar, pepper powder and salt. A very easy rice recipe that you cannot go wrong. I get queries from readers on how to make perfect fried rice which is similar to the restaurant fried rice. – The key to a good friedrice lies in the quality of the cooked white rice. It should have minimum amount of moisture so its always best to use cooked rice that has rested for a couple of hours or refrigerated cold rice. You can use basmati rice or jasmine rice or your everyday rice (samba, sona masoori, sannalu etc) that you cook. – Secondly, each rice grain should be separate and not sticking to each other. In other words, it should be dry. – Thirdly, the rice has to be stir fried on very high heat with continuous tossing so that the rice is perfectly roasted till compeletly dry and crisp and attains a sort of smoky flavor. 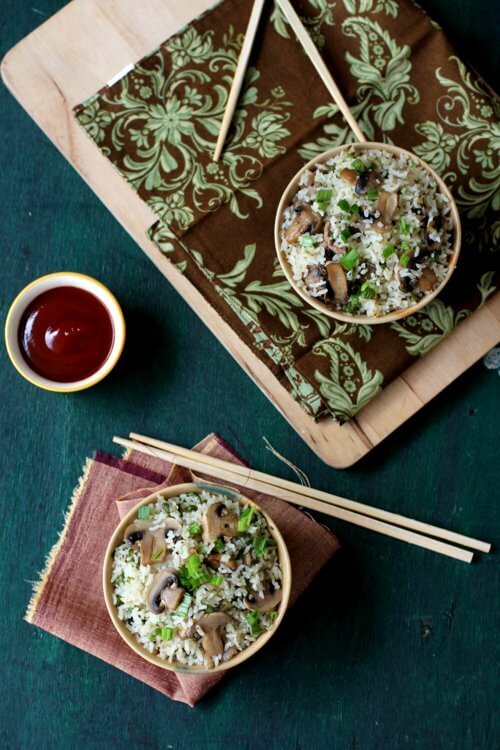 Mushroom fried rice has a perfect balance of sweet, salty, and spicy flavors. You can serve this fried rice as a complete meal on its own or serve it with sweet and sour vegetables or schezwan vegetables. You can also serve it with tomato sauce or ketchup. It makes for a satisfying and comforting one pot vegetarian meal. Do try mushroom fried rice recipe to savor the flavors similar to restaurant style indian chinese fried rice. Heat oil in a wok or a wide cooking vessel. Once the oil turns hot, add the minced garlic and saute for few secs. Add the beans and saute on high flame for 3 mts, tossing the contents constantly. Next add the capsicum and spring onion whites and saute on high flame, tossing the contents constantly for 2 mts. Add the mushrooms and cook on high flame, tossing content continuously for 3 mts. Add soy sauce and white vinegar and mix. Add the rice and mix well to combine. Keep mixing the contents while cooking high flame. The vessel should be well greased so that the rice does not stick to the vessel. Cook on high flame for 3-4 mts continuously. Season with salt and pepper powder and mix. Turn off flame. Remove to a serving bowl. Garnish with spring onion greens and serve with tomato ketchup or sweet and sour vegetables. You can add carrot, cauliflower and cabbage too. Saute them on high flame before adding capsicum and spring onion whites. You can scramble an egg and add to the fried rice at Step 4. Too easy nd simple recipes ! !